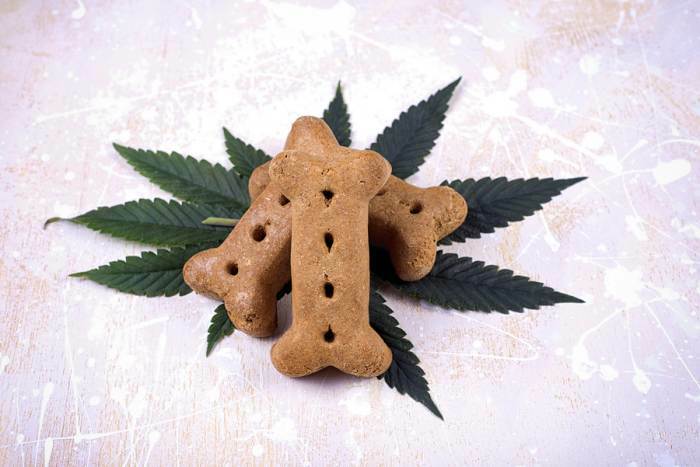 The use of cannabis based therapies for pets has generated a great deal of interest from pet owners around the world. Administering cannabis to treat animals isn’t new. In the USA, it was used in the late 1800’s to treat horses with colic and its potential is also mentioned in a 1914 issue of Proceedings of the American Veterinary Medical Association. As in humans, not all cannabis is equal when used a therapy for pets and there are some important differences to be aware of. Much more research also needs to be done to substantiate many of the claims made. Consequently, great care needs to be taken in selecting and administering these products. While cannabinoid receptors (what cannabis compounds act on) exist within all mammals, birds, reptiles and even fish; for the purposes of this guide the information mainly relates dogs and cats. This is very important. Dogs, and to a lesser degree cats, have a sensitivity to cannabis products that contain the psychoactive cannabinoid THC (tetrahydrocannabinol). It’s strongly recommended pet owners don’t use products containing anything but trace quantities of this compound. In US states where medical cannabis has been legalised, there are indications of an increased in incidence of marijuana toxicosis in pets due to these animals ingesting products containing THC meant for humans. Mild cases of marijuana toxicosis can be accompanied by lethargy and anxiety in dogs and cats. In more severe cases, it can result in urinary incontinence, ataxia, bradycardia (slow heart rate) and host of other symptoms. In particularly severe cases, while uncommon, marijuana toxicosis can result in coma and death. While THC should be avoided, a cannabinoid called cannabidiol (the one that shows so much potential for humans) appears to be generally pet-friendly – and it has no psychotropic effect. Most of the commercial pet products now available are based on cannabidiol extracted from industrial hemp, which in naturally very low in THC. While there appears to be a significant amount of anecdotal evidence regarding the use of CBD in successfully treating various conditions in pets, much more research needs to be carried out. Most research to date has been with rats and mice, and that has occurred in relation to human applications. The good news is that pet-oriented clinical trials are finally starting to occur. For example, the College of Veterinary Medicine & Biomedical Sciences at Colorado State University will be running a trial on the efficacy of cannabidiol for the treatment of epilepsy in dogs. Side effects of cannabidiol seem to be few and far between – there have been some reports of vomiting and sleepiness in some animals, but this appears to be most commonly associated with high doses of CBD. This is another area where recommendations vary wildly and care must be taken; again due to a lack of research. An anticonvulsive effect was noted in a study of rats with pentylenetetrazole-induced epilepsy that were treated with a high dose of CBD (20 and 50 mg/kg/d). However, this dosage rate doesn’t mean it would have the same effect on, for example, a dog with epilepsy. Generally speaking, if CBD is being tried for the first time, the general advice is to start low and go slow; keeping a close eye on the pet for any ill effects. For CBD oil products, it has been suggested 2 drops per kilo of body weight twice a day for new administration. The problem with such recommendations is that they don’t take into account the strength of the cannabidiol product. For this reason, any administration of cannabidiol should not be undertaken without expert advice – and dosage rates should be based on the specific product used as recommended by the manufacturer. Are Cannabidiol Products For Pets Legal? It depends on the country. It can also depend on whether the cannabis product is sourced from industrial hemp or marijuana. This has nothing to do with CBD from marijuana being different, it just reflects the different approach to regulations. Even in some countries where the products are legal, vets may be banned from prescribing it. While cannabidiol can be legally prescribed by vets in Australia, sourcing it is another issue. Some cannabis products designed for pets contain other cannabinoids aside from cannabidiol, plus terpenes. This is to take advantage of what is described as the “entourage effect”. Supporters of the entourage effect theory believe the many compounds in a cannabis plant can work together and maximize therapeutic effect. As mentioned, one cannabinoid that should not be present in products for cats and dogs is THC. Many of the points we mentioned on our guide to cannabidiol for human applications also apply to when purchasing CBD-based products for your pets. Note that often these products may not be marketed as medicines but as “nutraceuticals” or dietary supplements. This is because some government agencies such as the USA’s FDA prohibits vendors from mentioning diseases or medical conditions that can be treated without the product being properly registered as a drug. A major source of cannabis-based pet therapies is the USA, where there are no minimum standards set for cannabidiol products designed for animals – so it really is a case of buyer beware. Bear in mind too that there are unfortunately some vendors who have no interest in the welfare of pets, just the money that their owners have. Important: When buying CBD products, ensure they are formulated specifically for pets, rather than those for humans. What Sorts Of Products Are Available? It’s really important to involve your pet’s vet wherever possible if you decide to trial cannabidiol so there’s some level of appropriately qualified medical supervision. After all, our furry friends can’t vocalise if they are experiencing adverse effects and some of these effects may not be easy to distinguish. Even though cannabidiol has a good safety profile, veterinarian supervision becomes even more important if your pet is on other medication.